Use GelFinity Base for a superior adhesive bond between the nail plate and gel products without damaging the natural nail. Use GelFinity Base for a superior adhesive bond between the nail plate and gel products without damaging the natural nail. For maximum performance, use with your favorite KUPA gel products. Cure for 30 seconds in GelFinity UV/LED Hybrid Light or one minute in standard UV Light. 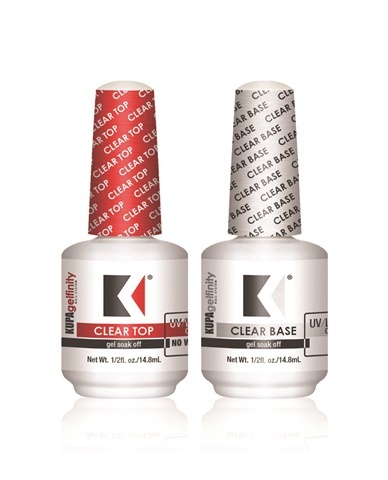 GelFinity Gel Top seals soak-off gel-polish to a high-gloss shine with a no-wipe finish. To remove, soak-off with acetone or polish remover. Simply cure for 90 seconds in a GelFinity UV/LED Hybrid Light or two minutes in a standard UV Light. For more information, visit www.kupainc.com.